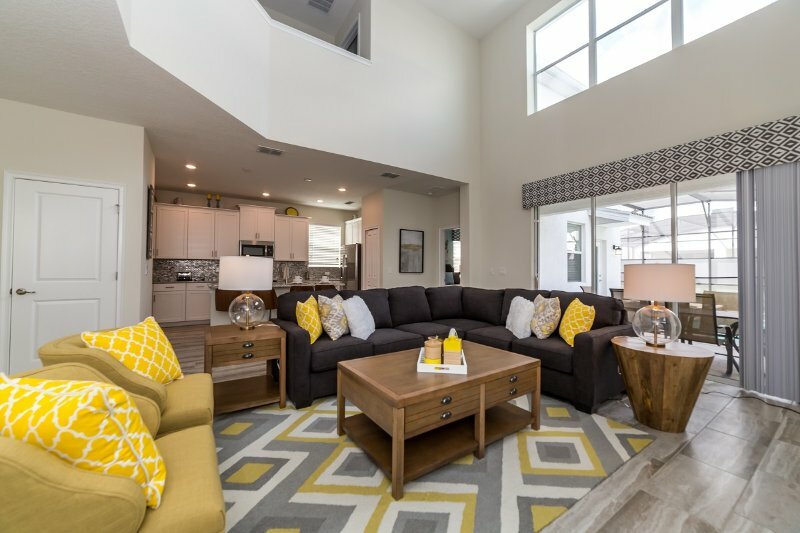 Storey Lake - Kissimmee is a brand new vacation community located just 4 miles to the magical world of Disney and just minutes to Universal, Sea World and the many water parks in the area. Central Florida is also home to some of the nation's top rated golf courses and many are within a 10 minute drive of Storey Lake. The prime location lends itself to the premier shopping corridor including the famed Millennia, top restaurants and the world renowned town of Celebration inspired by Disney. Storey Lake is also a 30 minute drive from the Orlando International Airport. The resort offers the best in family fun and is host to a wide variety of amenities and activities. This spacious 5 bedroom holiday villa can comfortably accommodate a large family or group of up to 10 guests. Designed for families and built for fun, Storey Lake Resort offers it all! Situated around a scenic lake with a variety of water amenities and activities including a tropical resort pool with lazy river, two waterslides and children's splash pad. Relax in the spa or sunbathe on the terrace and sand beach areas. Fishing, canoe & kayak rentals are available at the community dock. Enjoy a cold beverage or ice cream at the resort’s poolside café. Don’t forget to get in a game of mini-golf, volleyball or basketball. Escape the sun at the covered tiki bar or venture inside the resort’s clubhouse, which includes a guest lounge area, fitness center and business center. Central Florida's reknowned coastal region is only a short drive from Storey Lake! Within an hour you can be sunbathing at the Sunshine States fabulous Atlantic Coast and within only 50 miles you can enjoy the amazing waters of the Gulf Coast. Estimated price per night based on a weekly stay. Owner fees of $214.00 per stay may apply. Enter your dates to see the total cost.